Brett Kavanaugh, seen here during his confirmation hearing early last month, has served on the D.C. Circuit Court of Appeals for 12 years. His tenure there offers some clues to how he'll handle the most controversial questions before the Supreme Court. Brett Kavanaugh, seen getting sworn in before a confirmation hearing early last month. So, what can we expect to see from Kavanaugh on the biggest, thorniest issues likely to come before the Supreme Court? Of course that question won't be answered with certainty until we see him actually on the nation's highest bench — but there are clues to be found in Kavanaugh's past statements and opinions. Here's a brief breakdown of where the newly minted justice has come down on five major topics that have proven to be lightning rods in the courtroom and beyond. Scroll down or click from the list below to jump to a particular issue. Perhaps the biggest question hanging over Kavanaugh's confirmation hearings in September was the matter of Roe v. Wade. The landmark 1973 Supreme Court ruling made abortion legal nationwide — much to the anger and frustration of many conservatives, who have been seeking its reversal virtually ever since. With Kavanaugh on the court, conservative justices now have a solid majority, inspiring anti-abortion activists' hopes — and abortion rights advocates' fears — that the moment may finally be at hand. But is it really? Kavanaugh answered cautiously when asked about it during his confirmation hearings, saying the decades-old ruling "was settled as a precedent of the Supreme Court." Asked about Planned Parenthood v. Casey — the 1992 case that affirmed Roe and asserted that states couldn't place an "undue burden" on women seeking legal abortions — he called it "precedent on precedent." Those statements echo his comments in private before the hearings to Sen. Susan Collins, R-Maine, who supports abortion rights and who provided the critical vote needed to confirm Kavanaugh. At the same time, his record as a federal judge on the D.C. Circuit Court of Appeals adds nuance to these blanket assessments. One example surfaced as recently as last year. In a case that would later be decided by the Supreme Court, Kavanaugh's appellate court ruled in favor of an undocumented 17-year-old in immigrant detention who had been seeking an abortion. Kavanaugh wrote the dissent in that ruling, arguing that precedents are clear in "allowing the Government to impose reasonable regulations so long as they do not unduly burden the right to abortion that the Court has recognized." The court's decision supporting the teen, Kavanaugh argued, "is ultimately based on a constitutional principle as novel as it is wrong: a new right for unlawful immigrant minors in U.S. Government detention to obtain immediate abortion on demand." Still, even before he began his stint on the appellate court, Kavanaugh asserted that he would follow Roe v. Wade as established precedent. In his confirmation hearings to join D.C.'s federal appellate court, Kavanaugh assured Sen. Chuck Schumer, D-N.Y., of that — while remaining wary with his language, as he would more than a decade later. "The Supreme Court has held repeatedly, Senator," Kavanaugh said, "and I don't think it would be appropriate for me to give a personal view on that case." Again, like abortion, Kavanaugh's past statements on the extent and limits of executive power offer fodder for multiple interpretations. On the one hand, he cut his teeth as a young lawyer serving as an aide to Kenneth Starr, the independent counsel who led the investigation of President Clinton. On the other, he voiced resistance to such probes about a decade later, after serving for years in the administration of President George W. Bush. "Having seen first-hand how complex and difficult that job is, I believe it vital that the President be able to focus on the never-ending tasks with as few distractions as possible," he wrote in a 2009 law review article, laying out his case for a statute protecting sitting presidents from investigation. If we wanted a check on presidential malfeasance, Kavanaugh argued, the Constitution has already given us one: impeachment by Congress. "We should not burden a sitting President with civil suits, criminal investigations, or criminal prosecutions," he added. "The President's job is difficult enough as is. And the country loses when the President's focus is distracted by the burdens of civil litigation or criminal investigation and possible prosecution." That piece raised some eyebrows, particularly among skeptical Democrats — and particularly since the man who nominated him, President Trump, is now facing a special counsel probe of his own into Russian interference in the 2016 election. As Robert Mueller's investigation continues to deepen, the question of whether the president can be subpoenaed or indicted has been asked often. Kavanaugh's own answer remains unclear. For instance, just two years ago, he celebrated U.S. v. Nixon, the unanimous 1974 ruling that forced the embattled president to hand over subpoenaed materials, as one of "the greatest moments in American judicial history" — one in which "judges stood up to the other branches, were not cowed and enforced the law." 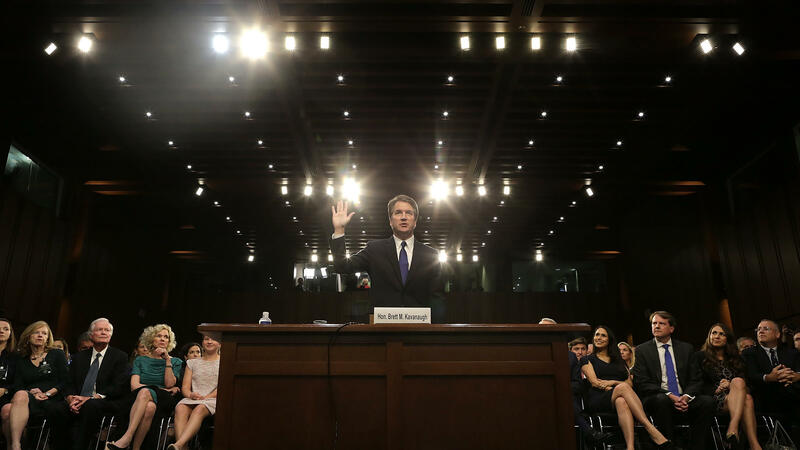 And during his confirmation hearings last month, he refused to answer senators' direct questions about the subject, saying that he, like other justices in their hearings before him, would not address "hypothetical cases." That did not exactly ease Democrats' concerns. Oddly enough, the high court has very seldom weighed in on the Second Amendment. In fact, the last landmark case to address the matter came a decade ago, when the Supreme Court's split decision in D.C. v. Heller expanded the amendment's protections to include not just groups, but individuals as well. That expansion did come with limitations, though — and as NPR's Nina Totenberg explained earlier this year, "it has long been assumed that the caveats in the decision were the price" of getting Justice Anthony Kennedy on board with the majority. Now that Kennedy has retired, what will his successor have to say? 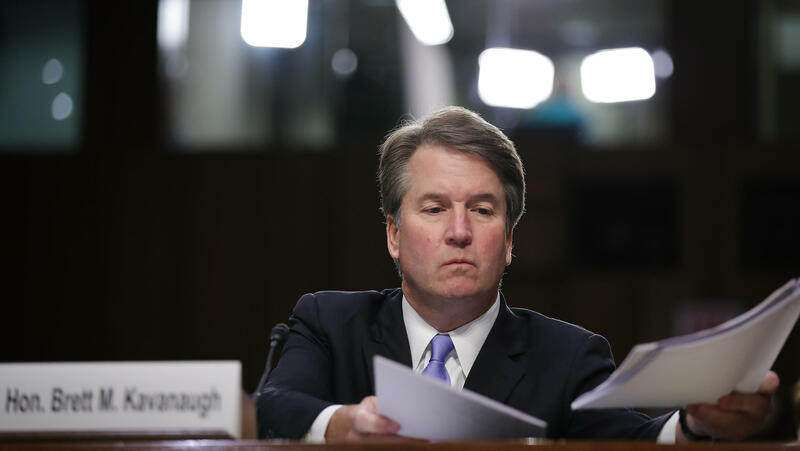 "Kavanaugh believes in a very vigorous Second Amendment right to bear arms," UCLA law professor Adam Winkler told Totenberg, "and he thinks there is little room for constitutionally permissible gun control." In this respect, Kavanaugh's position has been clearly defined. "In disapproving D.C.'s ban on handguns, in approving a ban on machine guns, and in approving longstanding regulations such as concealed-carry and felon-in-possession laws, Heller established that the scope of the Second Amendment right — and thus the constitutionality of gun bans and regulations — is determined by reference to text, history, and tradition," he wrote in 2011. The comment was part of his 52-page dissent from a federal appellate court ruling that backed a ban on assault weapons in Washington, D.C. He carved out a position that is strongly in favor of gun rights — and strongly skeptical of any new or novel limitations on gun ownership that break with "tradition." In this respect, he argued, the Second Amendment should be treated much like the First. "A ban on a class of arms is not an 'incidental' regulation," he wrote. "It is equivalent to a ban on a category of speech." Hints of Kavanaugh's position can be gleaned from a couple of recent cases before the D.C. Circuit Court of Appeals — and that position looks not unlike that of his predecessor on the court, retired Justice Kennedy. Kennedy, the court's quintessential "swing vote," famously swung toward the conservatives in the split Citizens United ruling, which held that the First Amendment protects unlimited independent political spending by corporations. That 2010 decision dramatically loosened campaign finance laws and opened the spigot on political money. Just one year later, Kavanaugh addressed the matter of campaign finance in a case concerning foreign political contributions. In this respect, he sided with precedent that non-U.S. citizens could not contribute directly to candidates or political parties — but he made clear that his opinion was to be taken narrowly, and did not address whether foreign nationals could make contributions on behalf of political issues. That limited scope took on added importance when the Supreme Court later affirmed the ruling of Kavanaugh's court. Now, as high court precedent, some have argued that the narrow ruling suggests foreign political contributions are OK — just so long as they support political issues, rather than actual candidates. In fact, that's precisely the argument put forward by a Russian firm that was indicted for interference in the 2016 election. In a court filing earlier this year, Concord Management and Consulting cited Kavanaugh's 2011 opinion in defending its efforts as mere "issue advocacy," not outright support of a political candidate. But progressive advocate Chiraag Bains told NPR's Peter Overby that perhaps Kavanaugh's position on campaign finance can be seen even more clearly in a decision rendered one year before Citizens United. In that case, Kavanaugh ruled that the group EMILY's List could raise unlimited funds through a nonprofit wing dedicated to issue advocacy. "That opinion, to me, shows that even before Citizens United, Kavanaugh had bought into the idea that donors have the right to make limitless expenditures based on the out-of-touch idea that if spending isn't officially coordinated with a candidate, it cannot ever be corrupting," Bains told Overby. Kavanaugh has proven to be a skeptic of the Environmental Protection Agency and other federal attempts to establish environmental regulations without consulting Congress. In 2012, he dissented from the appellate court ruling that upheld EPA regulations on greenhouse gas emissions, saying that it didn't matter that they "may well be a good idea as a matter of policy." implement that policy within statutory limits, and courts in justiciable cases ensure that agencies stay within the statutory limits set by Congress," he wrote. If federal agencies overstep those bounds — as the EPA did with its pollution regulations, according to Kavanaugh — they're grabbing powers from the other branches. "In cases like this one," he noted, "the bedrock underpinnings of our system of separation of powers are at stake." His prevailing point in this case — as with others, such as his 2013 dissent objecting to a Justice Department action against SeaWorld — was that agencies must stay in the lanes allotted to them. Or, as he asserted to Sen. Amy Klobuchar, D-Minn., during his confirmation hearings: "Ultimately, my approach to statutory interpretation is rooted in respect for Congress."